Come one, come all to “Walk and Roll,” the College of Social and Behavioral Sciences (CSBS) community walk, designed to raise money for CSUSB scholarships. With tuition increasing every year students are constantly looking for alternatives to their tuition and fees. What better way to pay for college than a scholarship that you don’t have to pay back? The “Walk and Roll” event will be held Saturday, March 5 at 9 a.m. in front the John M. Pfau Library. In the event of rain the event will be held inside the Coussoulis Arena. According to CSUSB’s “Walk and Roll” website, state support for higher education continues to decrease and fees continue to increase, a college education is becoming increasingly unaffordable for our students. The website also states their desire to help support students because ultimately students are the future. This event is a community activity that invites alumni and friends to walk or roll a three mile course to show their support for current and future students in the CSBS. At CSUSB, every college department offers some type of scholarship. Students are able to take advantage of these scholarships in order to pay for their college education and experience. “This event is so important because the Social and Behavioral Sciences is raising money and working toward an endowed scholarship that will be available to students within the social and behavioral science majors,” said Stacy Brooks, administrative coordinator for Department of Psychology & Human Development. 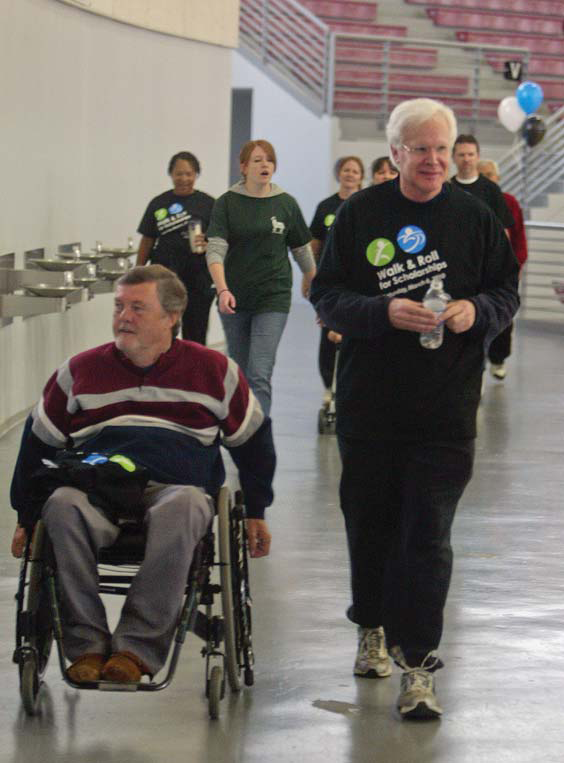 Dr. Albert Karnig was also a familiar face seen at last year’s fundraising event , walking his way around the Coussoulis arena in show of support. The event brings all aspects of the campus coming together, trying to help students obtain the best education CSUSB has to offer. With such prominent staff and faculty present at the event, students are able to grasp and see magnitude of CSUSB’s collective community. “To make the event even better and more collaborative, other departments will also be there to help out,” said Brooks. Trainers from the Student Recreational Sports Center will be coming before the walk to lead warm-ups for walkers as well as cool-downs afterward. “Coyote Radio will be there to create a more upbeat atmosphere by providing music while participants walk,” said Brooks. Scholarships can provide a truly life-changing opportunity. If you, your parents, or even a group of co-workers are interested in signing up , feel free to register at walkandroll.csusb.edu. Registrations will begin at 8 a.m. that morning before the walk. If you are interested in participating the fee per individual is $25, students are $10 and groups of five are $100. Participants will receive a black T-shirt with the walk and roll logo on it. If you are not able to participate in the walk and roll event and would rather volunteer contact Stacy Brooks at 909-537-3573.